The Club runs teams in the Bucks LTA Shield, Team Tennis, Aylesbury & District and Oxfordshire Babolat leagues. Matches take place on Saturday and Sunday afternoons and Tuesday evenings. Check the Events page to see when matches are scheduled. The club runs team coaching sessions from time to time. These sessions are designed for match players and include various drills and tactics to improve your play. The Annual Club Tournament is held in the summer months and is open to all members. 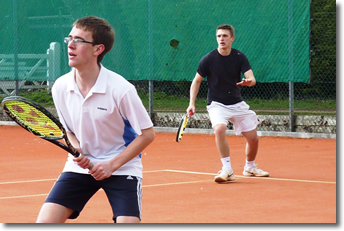 The event culminates in a Club Finals Day in September, combining serious tennis with a BBQ for players and spectators. Other one-day tournaments are held throughout the year, designed for members to play and enjoy tennis but with a competitive edge. The Kennedy Cup will be held on Sunday May 26 and the Jamison Cup on Sunday August 4. The Mr & Mrs Competition ends the season on a lighter note on Sunday October 13. Tournaments are also arranged for Junior members in different age groups with a major Junior tournament on Sun Sept 8. 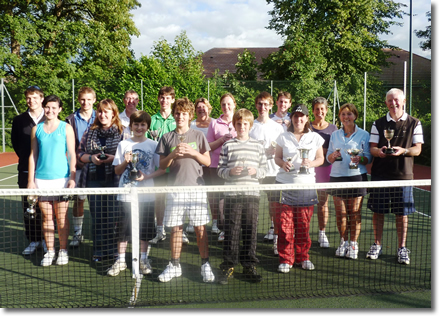 We also run singles box leagues for adults and juniors at different times of the year.